At the wedding, the bride wants to be a princess. To embody this vision a reality will help a wedding dress with a train, because in such an outfit used to be to get married in august persons. This bride clothes perfectly able to emphasize the dignity of the figure of the girl and create a truly royal image of the bride. What you need to know when choosing a "royal" wedding dress? Flex as part of women's clothing, there was alight hand of Agnes Sorel in the 15th century. Daring favorite of Charles VI became the founder of fashion dresses with majestically trailing tail. Initial bias against the Church to the parts of the female toilet has changed to the 18th century. Since that time, all the king's person walking down the aisle in dresses with majestic tail of cloth. And its length was regulated depending on the status of women. The Queen could afford clothes Trailing skirt up to 6 meters, the princess - up to 4 m, and the other ladies - up to 1.3 m.
A short (up to 30 cm) is perfect for any wedding. It will be easy to move around and dance. The average (length from 70 cm to 130 cm). This tail is clearly visible to the guests, but it always have to raise or correct when moving. Maxi (1 meter or more) is suitable only forgrand weddings. Bride in it self is difficult to move, so you'll need a few people to carry this part of the image of the bride. Removable. This is a convenient option, because the girl in the first half of the celebration will feel like a princess with him, and during the banquet otstegnet dragging an item of clothing and without discomfort will have fun on their holiday. Shaped slim line dresses with a "tail"there are many. Well look curvy, short, straight, skinny model with the original trailing the bride skirt continuation. Whichever you choose a wedding close-fitting model with an extended skirt, it will make your image of the bride more harmonious, stately, exclusive and truly royal. To help you cope with a long "tail", sew the end of the skirt of the loop tape for dressing on the finger or wrist. Then you will be able to shorten the bottom of the dress by wearing it on hand when needed. For girls with a narrow waist, beautiful breasts andbroad shoulders and hips are perfect-fitting wedding dress with a train silhouette of "mermaid". This bride's clothes will turn the ceremony into a bright and spectacular celebration worthy of a princess. The fitted style "mermaid" shape fits women up to the knees, and then the lower part of the skirt and extends smoothly into the elongated bottom. Perfect Bride figure in this dress will look just adorable. Newlyweds, dreaming of a wedding dress withdragging the bottom part can survive cope with it whether at the ceremony, will not get there in awkward situations because of the lack of experience of wearing a "tail." For these girls compromise is to choose dresses with detachable skirts. This is a good, practical option for Suite, because the long accessory is easy to fasten to the top of the skirt during the official part of the registry office, and a photo shoot. And after that you can detach it and be at the banquet in a convenient form of wedding attire. If you want to find a model with a long,single cut and a comfortable train, then pay attention to the dress with tucks "tail" which shortens the principle bustle. This means that using a bottom drape neat folds back and cling to the upper skirt. As a result of the lower part of the dress becomes volume and similar to something like a bustle, which in the past, women created by placing pillows under her skirt from behind from the waist down. In order to tuck the bottom of elongated dresses,it is raised and fastened the buttons at the waist or to the underside surface of the upper skirt. With beads, embroidery or lace eyelets are masked and other supporting elongated hem, which are used for loop transformation. If necessary, dissolve the bride skirt bottom, and during the dance turns and transforms the look of your outfit. 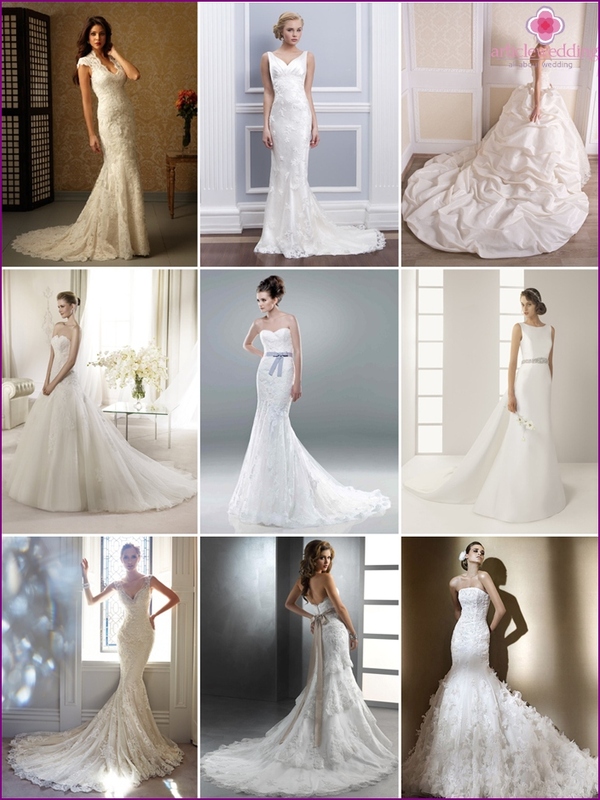 How to choose a form-fitting wedding dress with a train? For young girls, who can boastbeautiful legs, perfect short dress with an elongated tail. Bride it will look spectacular and extravagant. To create an original image of the bride, a removable piece of clothing from the side. Asymmetrical style will look on the girl extraordinary and safely. The longer the trail, the more weight you have towear on yourself during the celebration. And if you still will be high heels, then you will be too heavy to walk. Given these characteristics, prudent approach to the choice of the length of the hem of the skirt. When choosing a dress with a detachable "tail" thoroughly check the reliability of fixing parts. This will avoid the embarrassment and inconvenience during the celebration. Equip elongate bottom skirt or eyelethook to fasten to the waist or put into the hands of an elongated piece if necessary. This will help to protect the wedding clothes from dirt when crossing the street or to the marriage for the restaurant. Be sure to work out in front of a triumphart wearing the dress with a tail. This will help your wedding day to be the epitome of grace and femininity, to avoid awkwardness and downs because of the inability to cope with the hem of her skirt. 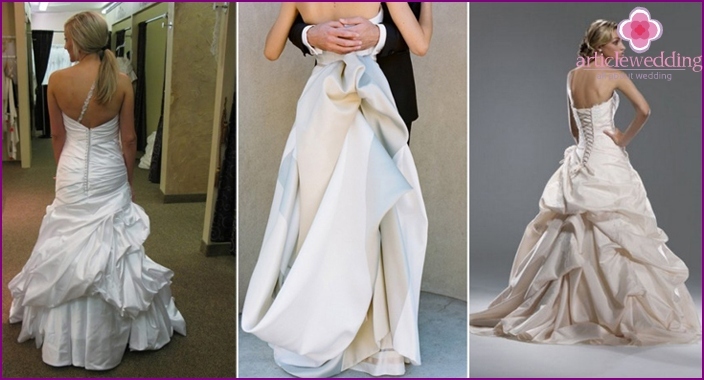 The "tail" made of satin or silk will deliver less hassle the bride, because it is a good flow and will not engage. Ask a reliable person to help you during the celebration, maintaining an elongated tail clothes, then you will not be able to experience and fully enjoy your holiday.